We like to eat outside when the weather is warm, and I enjoy having cookouts. One thing that is a constant with outdoor dining is the breeze that will take all the napkins off the table before you can catch them. 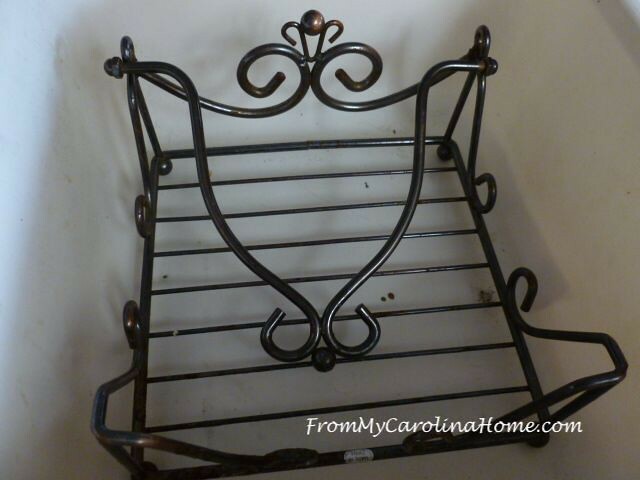 So, when I found this lovely iron napkin holder at a thrift store for $1, I nabbed it. The lady behind the counter had to ask me what it was, LOL, they just don’t make these things anymore. It was in really rough shape, the surfaces which at one time might have been a brass color had significant rust. But I knew I could do something about that. DH had a solution he wanted to try soaking it with, so we found a bucket that it would fit in. But the etching solution didn’t work. 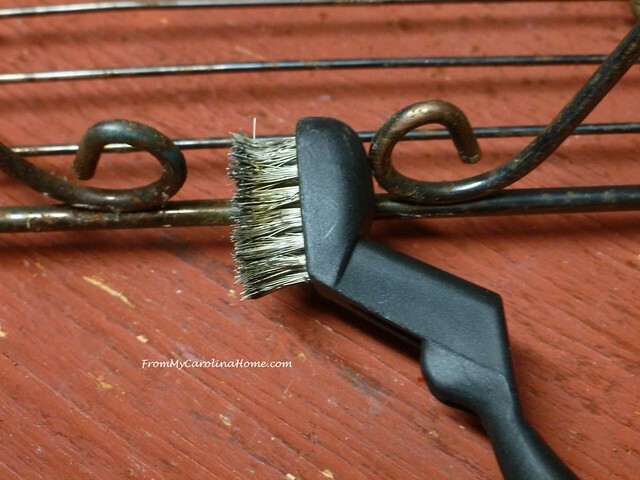 He had a wire brush and a dremel tool, and he set to work removing as much of the rust as he could. I actually planned to do this part myself, but I think he wanted a project, so I let him run with it. 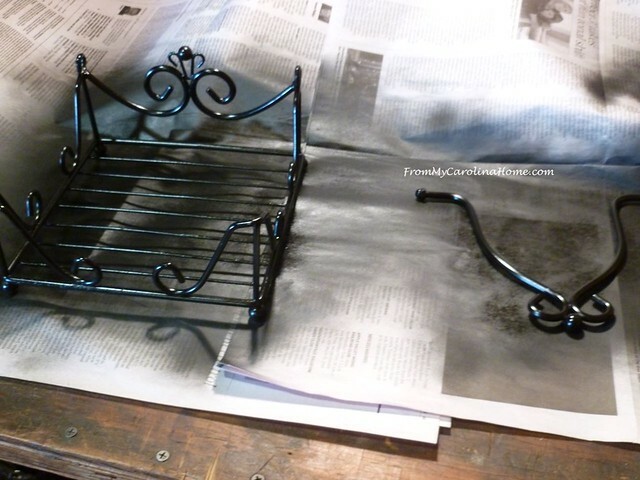 After cleaning it up as much a possible, the two pieces were separated and a coat of rust covering spray paint was applied in glossy black. Then a second coat, and turning it upside down to get all the surfaces painted. A third light coat was added, and it was allowed to dry thoroughly. Reassembled, it now is ready to use, looking almost new. 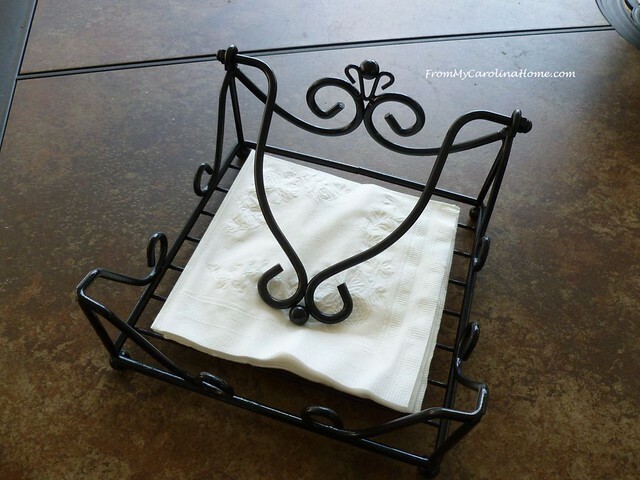 It holds dinner size napkins nicely, and will come in quite handy at our next buffet cookout. 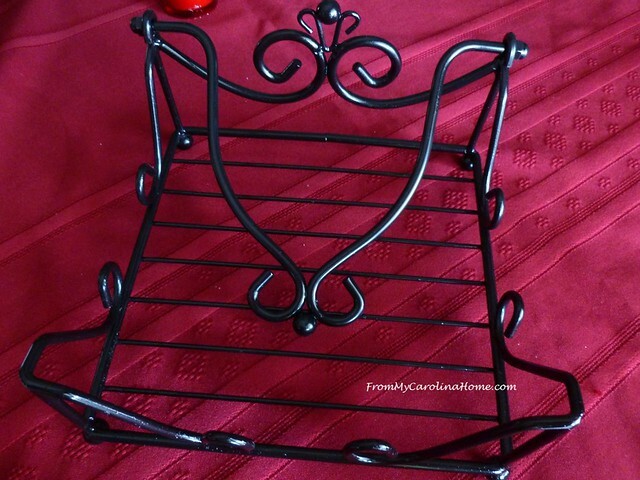 I like the graceful lines of the piece, and in black it looks like wrought iron. 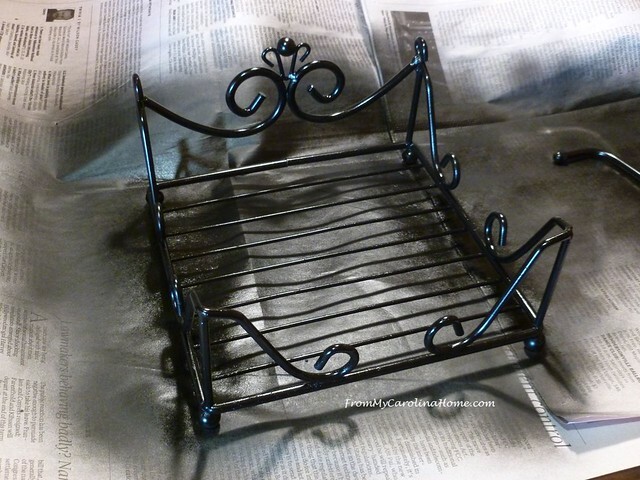 Spray paint is a wonderful thing, isn’t it? 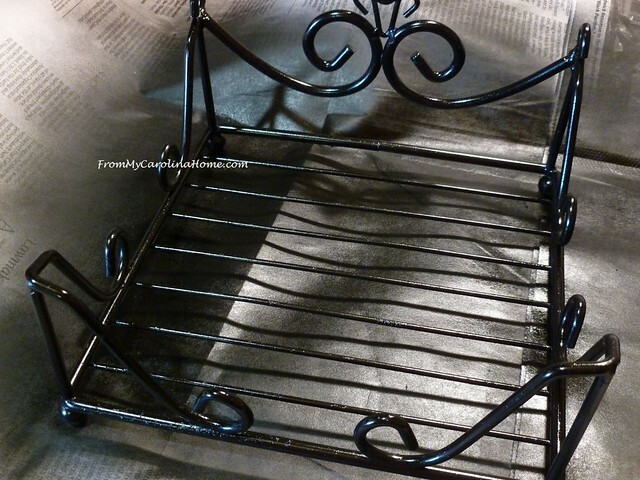 I have another paint project coming up soon for another DIY thrift store find. Do you like to rescue old things and give them new life? 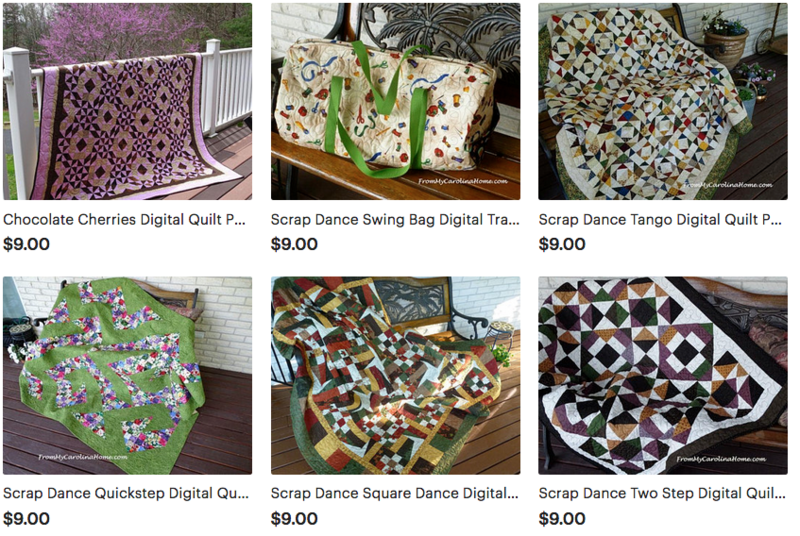 My blog is a variety of subjects, quilting and sewing, tablescapes and recipes, book reviews and hand stitching, crafting and mountain living. I love to have new followers, too! 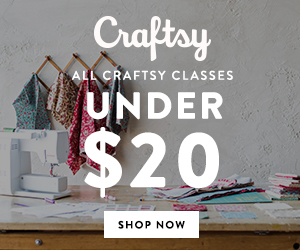 See the buttons on the sidebar to follow by your favorite method. 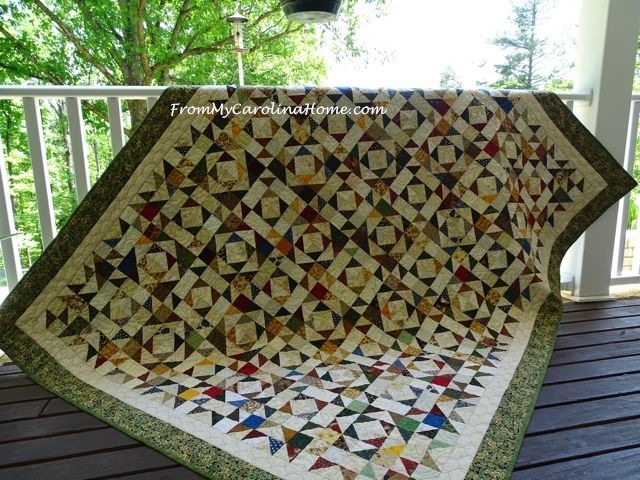 If you are visiting from Hometalk, Fave Quilts, All Free Sewing, Pinterest, a link up site, or just found me, please stay a bit and have a look around, my tutorials are gathered at the top in pages to make them easy to find. 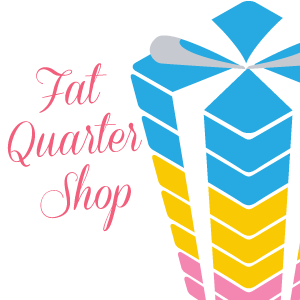 Lots of fun is had here, and I invite you to follow with any of your favorite methods, see the sidebar for ways to follow. 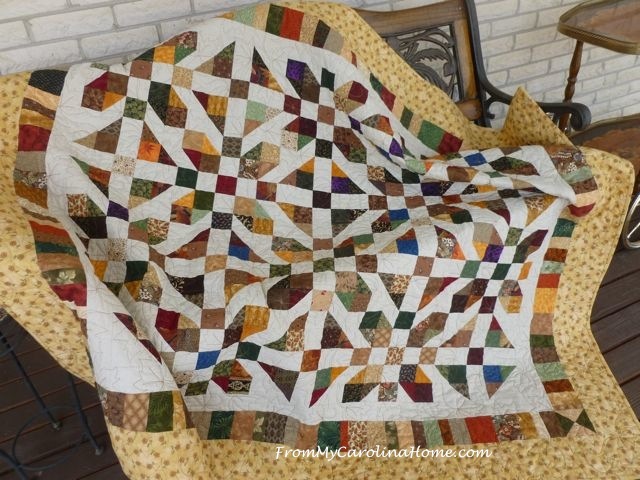 My fourth mystery quilt is in progress in 2018, click on Scrap Dance Square Dance on the sidebar for the first post. Click on the Home page to see the latest posts on the blog. Beautiful Job restoring a treasure! Great find! what a great find! I love it. I rarely find things that I can fix like this I guess I do not look hard enough. If I had better stores here I would look harder. Very nice find and the price was right. Good job! Young again with a new hairdo and a new outfit. Soon I’ll look as good as a new lady. My husband’s family has a home made wooden one of these. It is handy for a breezy day. Yours is much nicer, especially now that you fixed it up! What a perfect solution!! It looks as good as new, possibly better! That looks great and will be so useful now. That was a great use of a dollar and a little elbow grease! Definitely worth the effort. This is a wonderful find. Cute! You went to a lot of trouble, but it will be handy! what a beautiful restoration project! 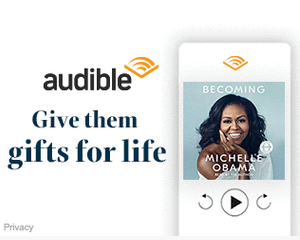 I do, but not things that require paint. I have no ability in that area, and always wind up with a mess. Your project, however, looks fabulous. I would never guess it was a thrift store find! What a nice Addition to your spring and summer table. 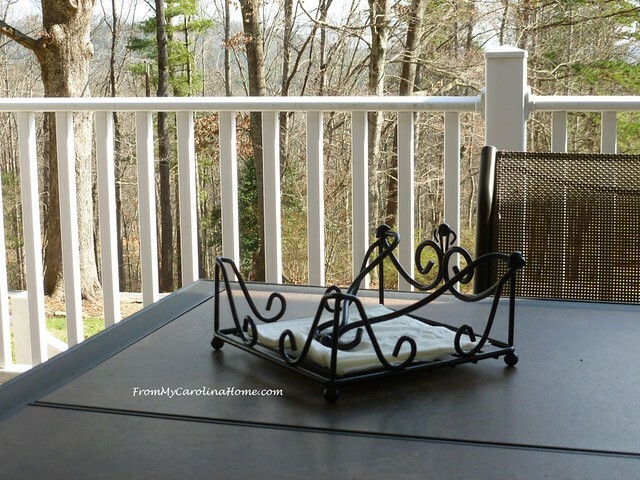 Being a Carolina Girl too I know we spend a lot of time socializing with food on our porch too! 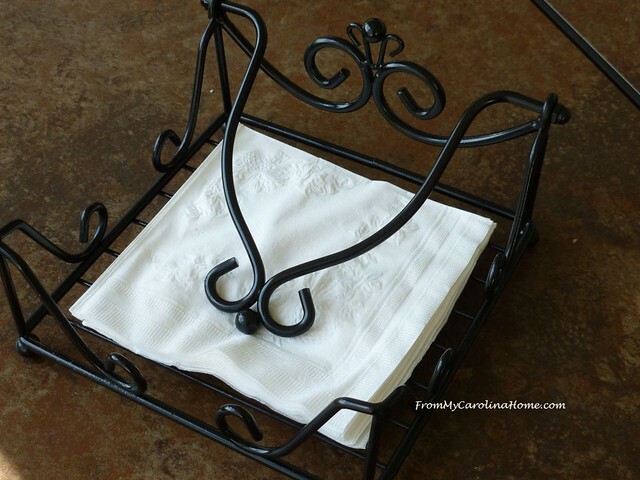 I love how you rescued that napkin holder. It looks great! 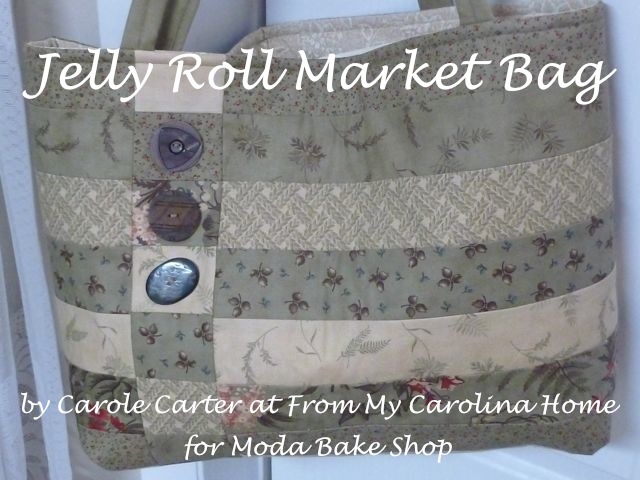 Excellent upcycle, Carole! 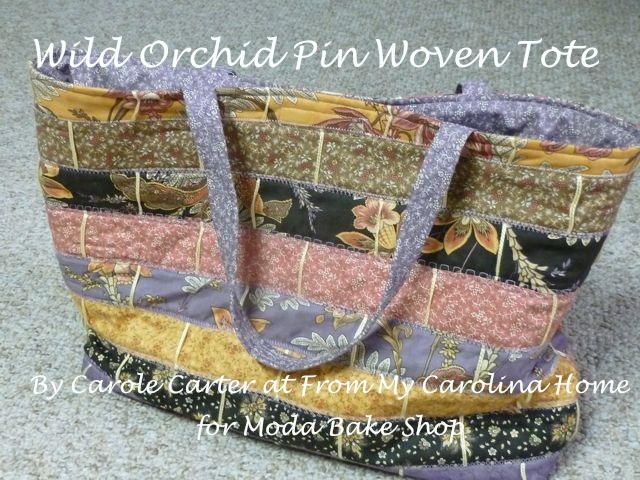 Thank you for sharing at Vintage Charm!